The Baylor Bears are no longer undefeated. The rain and chippy nature of the game made for great television. I thought the Bears running game was a bit less effective than Oklahoma’s and there was almost no answer for Baker Mayfield‘s ability to extend plays. Oklahoma might find itself back in CFB Playoff contention (9-1) with games remaining against TCU and Oklahoma State remaining. Baylor really missed Seth Russell and the Sooners quieted Corey Coleman, who was covered well all night. I suppose we will have to wait for the year that Baylor puts it all together and wins the national title. Baylor is in a similar situation to Oregon. The teams are offensive juggernauts and are always being put up as the nation’s elite. The Ducks and Bears haven’t won a national title yet. These teams have both struggled with the power-run elements that some of the best college teams use. Jake Coker looked sloppy and mediocre. It just does not even matter. Alabama’s defensive line pushed around Mississippi State’s offensive line for the entirety of the game. I thought Mississippi State had some opportunities early in the game to take the lead and keep the crowd into it. They could not do so and Alabama’s punishing style was too much. Dak Prescott, one of the best Bulldogs ever, passed for 300 yards and threw one interception. He was sacked about 60 times. Mississippi State’s struggles up front are a reason for concern and they’ll travel to Arkansas next weekend. 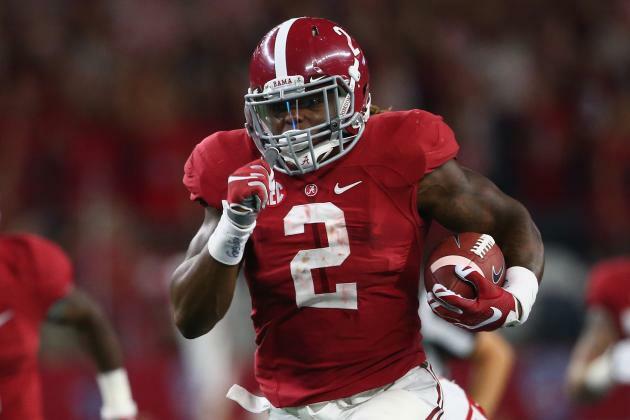 Alabama’s Derrick Henry looked great and the Crimson Tide are the nation’s best team in my opinion. The Crimson Tide‘s veteran defensive players are the biggest key and I would have a hard time picking against Alabama going forward. 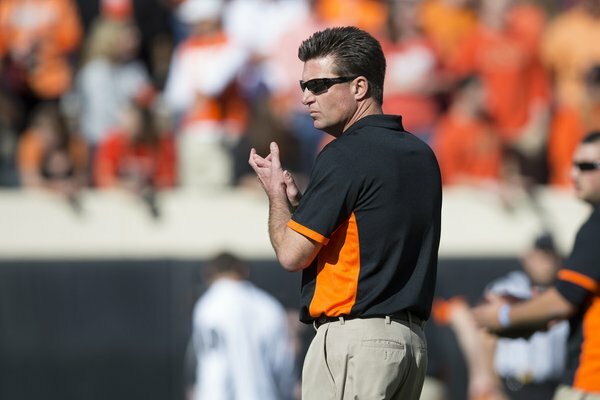 Mike Gundy might have the best hair in all of college football. Mike Gundy‘s boys got it done on the road. I don’t know why Oklahoma State is always struggling in Iowa. Gundy, who would probably request that information, kept things sharp and went a little unconventional in the Cowboys’ win. The Cowboys have avoided turnovers and used their short-yardage QB, J.W. Walsh, for the entire 4th quarter. I think Oklahoma State is one of college football’s biggest mysteries. They’ve struggled at times with lesser competition. They’ve won every game and showed a lot of resolve in doing so. The reality of college football (perhaps outside of Alabama and Ohio State) is that it is difficult for a team to play their best more than about three times per season. Oklahoma State has a lot of resolve and has responded to things not going their way. The Cowboys host Baylor and Oklahoma in the final two weeks. The road to the CFB Playoff goes through Stillwater, Oklahoma for any Big XII team hoping to make a run. Trevone Boykin injured his ankle and will try to play versus Oklahoma. The Horned Frogs struggled without him and only beat Kansas 23-17. North Carolina is really good and needs to be ranked higher. LSU is on a steep decline and the offense needs to be reevaluated. Arkansas, on the contrary, is on fire right now. The Hogs are on the rise and nobody wants to play them right now. Stanford fell to Oregon at home and now the Pac-12 has no chance of getting a team into the CFB Playoff. Georgia looks to have corrected the course of their season and are now 7-3. Vanderbilt is 4-6 after defeating a Kentucky team that is sinking like the Titanic. Clemson wasn’t great in a win over Syracuse, but if they can keep winning they’ll be in the CFB Playoff. Houston is 10-0 and Tom Herman will be receiving a multitude of job offers very soon. Levi’s (referring to myself in the third person) Heisman ballot is changing with each week. I didn’t intend on so many updates to this list. I hope there is some stability to the ballot soon, but right now the final group has been pretty fluid. Henry has been the most consistent part of the Alabama offense and has risen up to the top spot. Henry’s remaining games should allow him to bolster his impressive stats and Alabama will get a chance to play against another top team in the SEC Championship game against the Florida Gators. Henry can eliminate all threats to his campaign with three more decent games. Watson is the best player on an undefeated team. He will has impressive stats and has Clemson poised for a CFB Playoff bid. I don’t know if Watson has enough big games left in order to make the push to the top of the ballot. Elliott has been incredibly consistent and I think his performance has been less visible due to the quarterback controversy at Ohio State. Elliott’s numbers are nearly identical to Henry’s and he could gain added notoriety with two big games upcoming for the Buckeyes. Mayfield is having a great season and he’s totaled 37 touchdowns. Mayfield’s got one of the best QB ratings and has Oklahoma in position to get into the CFB Playoff. Mayfield won’t even be invited to New York if the Sooners lose and the team will need to win two more tough games. I don’t know how many guys will get invited, but I could see Mayfield being a part of the final group. The Tar Heels are the hottest offense in the nation and Williams has some huge numbers. The Tar Heels did lose to South Carolina to open the season. The loss won’t matter if North Carolina wins out and beats Clemson in the ACC Championship game. 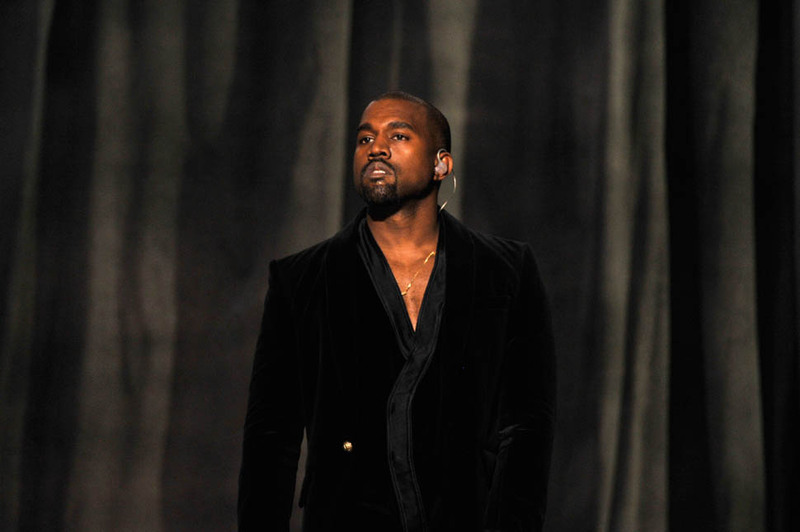 Kanye is one of my favorite artists and has been since I was in middle school. I have all of his albums and I felt like this would be a great week to let his music guide the college football playlist. Album names will be appear in parenthesis. I’m willing to admit that my favorite album on the list is probably The College Dropout, which slightly edges out his Graduation album. I don’t know if there is an album that I dislike, but Watch the Throne was probably the album that I listen to the least. I’ll break it all down. Baylor’s undefeated season and championship dreams took a massive hit and the rain fell down in Waco, Texas. The Bears are the “Oregon of Texas” and they looked like just that. They wilted in a huge game and couldn’t stop the run. 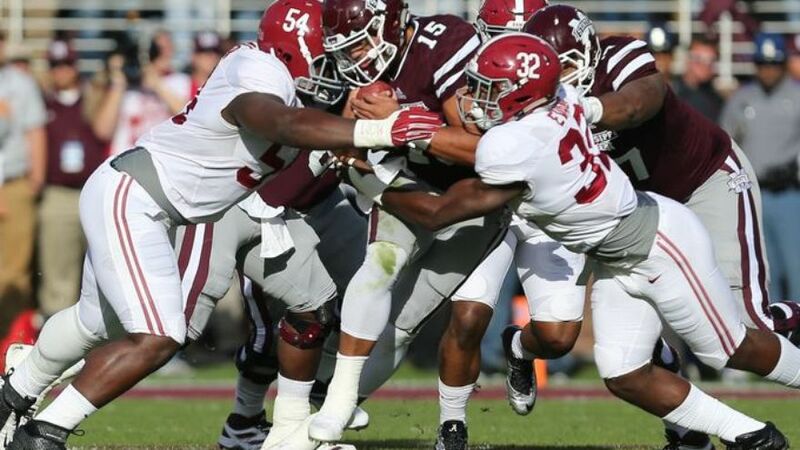 Mississippi State’s offensive line will see Alabama in their nightmares after getting dominated over the weekend. LSU is playing the blame game right now. Is the offense struggling because of Les or Cam Cameron? Who is responsible for the disappointment of these consecutive losses? I’m guessing Cameron is a convenient person to blame and is in his last year of his contract. The blame will be on Les next year. Georgia is bound to make some changes next season to their offensive staff. Alabama’s running game and dominant defensive front make them the most powerful team in college football. Texas Tech’s offense seems unstoppable and they look like they are improving under Kliff Kingsbury. 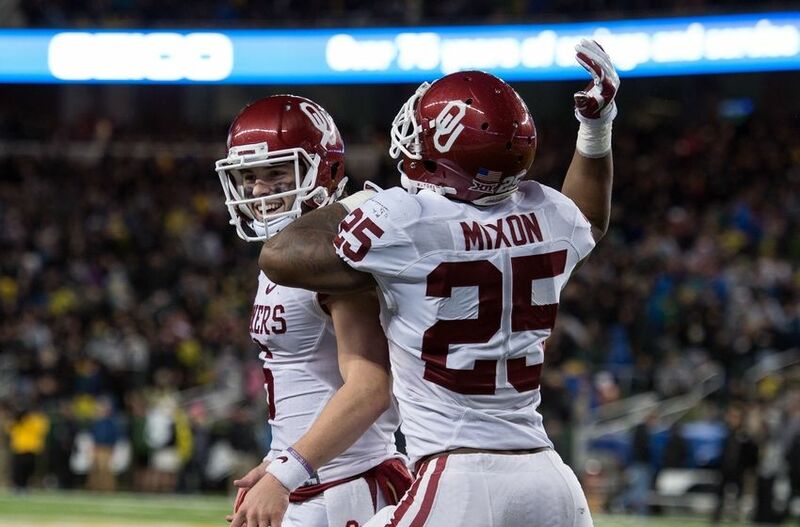 Stanford’s CFB Playoff hopes are gone after a devastating loss to Oregon. Oklahoma State is going down to the wire an awful lot this season. They are coming through the wire when it matters and are 10-0. Florida State is located in Tallahassee, Florida. T-Pain is from Tallahassee and added his vocals to this particular track. It felt right. Vanderbilt’s gold uniforms and ability to dig deep defensively were key in the ‘Dores’ 4th win of the year. Auburn lost a tough game and the bad news is that the Iron Bowl is looming. Iowa fans believe they are in the CFB Playoff hunt (which they are, at least mathematically) and are being disrespected.